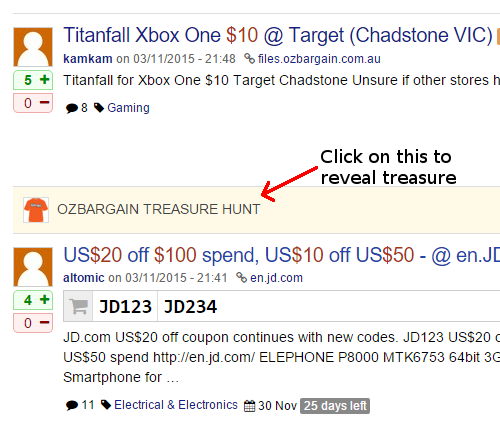 UPDATE: OzBargain Treasure Hunt has finished. For those who have claimed treasures, please go to marketplace to fill out the delivery information. TL;DR: To celebrate OzBargain's 9th birthday, we are running a treasure hunt / prize giveaways between 10 and 27th of November. Just log into this site to participate. Make sure you are logged into OzBargain, and are not currently in the penalty box. Browse around the website to spot treasure items. Claim it when you spot one! At the end of Nov 27, prizes will be given out for the treasures you have claimed. Sounds easy? Here are the details. Everyone can participate. However you need to be a logged in user to see the treasures. Users who are currently in penalty box will not be able to see scattered treasures nor claim them. Sockpuppeting or creating multiple accounts will also risk to have all your accounts banned — so don't even try. Users who have been found gaming the system (cheating, bots, programmatic, etc) will also be blocked from receiving the prizes. When is the treasure hunt starting & finishing? Treasure hunt will official start today (10 Nov 2015). I'll be seeding the site with treasures later this afternoon. The hunt will finish on 27 Nov 2015 at 11:59PM ADST, and the treasures you have claimed will be your winning items. I will be buying and sending the prizes to the winners the following week after we have collected the delivery information. Since it's OzBargain and it makes no sense buying RRP — so the prize winners might need to wait a bit when I go and hunt the actual items. For products marked with [x], the treasures are split into multiple parts, and you need to claim all the parts to be the winner of the treasure. For example you need to claim all 3 parts of Xbox One Console in order to win the prize at the end. We will also be adding more products throughout the treasure hunt. What other treasures should we give away? What other hot products that an OzBargainer should own? Suggest in comments! How do I spot a treasure? It's all in the probability. For example on each page loaded, 2% of the chance an OzBargain T-shirt will show up in the page, but the probability is lower for other higher-prized items. Basically if you are an OzBargainer that can't stop reloading the home page, sooner or later you'll spot one. Throughout the treasure hunt game, I will also place some treasures with higher probability in specific pages. More hints will be left in the comments on where to find them. Also note that the treasure will only stay on the page for 15 seconds. So it might be wise to scroll up & down when you first load the pages to see whether there's a treasure. How do I claim a treasure? Once a treasure is revealed you should have 3-4 minutes to claim it (before we expire it in the backend). If you already have 4 items in your inventory, you will then be given an option to drop an existing item to claim the one on the page. Dropped item will be released to the wild to be picked up by another lucky guy. When a treasure is first claimed, it would be private under Your Items. 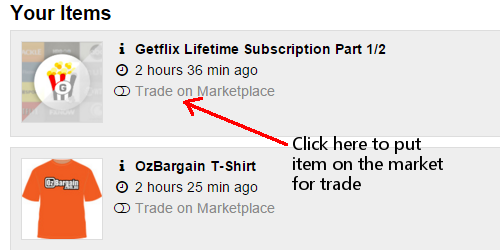 Click on the toggle "Trade on the Marketplace" to make it public, available for trade. Under Marketplace you will see a list of items that other users have made available to trade. Clicking on "Trade Item" will bring down a list of your own items that you wish to swap with. When currently there are pending trade requests against the items under your inventory, there will also be a section Trade Request. You can then approve or reject those trade requests. Users will be notified when there's an incoming trade request, or when your trade request has been approved or rejected. Please note that item trading is one to one only — one item in yours inventory trading with another item that's currently on the market. It is not possible to do one-to-many trading. Since you cannot win by simply having part 2 out 3 of a high prized item, Bob puts his Xbox One Part 2/3 on the market. While browsing the marketplace Alice found that's exactly what she needed. So she clicked on "Trade Item" next to Xbox One Part 2/3. Being a cheapskate she decided to use her Eneloop AA 8pk to request the trade. "WTF?!" as Bob already has boxes of unopened Eneloops at home, so he responded with "Reject" on the trade request. Not be discouraged by the rejection, Alice requested the trade again with her most valued possession — OzBargain T-Shirt. Moved by her determination, Bob accepted Alice's trade, items swapped inventories, and both live happily ever after (with their OzBargain treasures, of course). Sounds exciting? Get your hunting hat ready and have fun! Nah just the headphones for me! Are treasures released all at once each day? If so, can the release be staggered during the day? It's limited to four prizes per user. Jar Jar binks on 13/11/2015 - 21:14 Comment score below threshold (-14). CandyMan on 15/11/2015 - 18:17 Comment score below threshold (0). Jar Jar binks on 15/11/2015 - 20:46 Comment score below threshold (-2). CandyMan on 15/11/2015 - 21:23 Comment score below threshold (2). same here. :( dissapointed.. been searching .. for a long time now.. !! There are browser addons that do that for you by the way. See nothing…..decided wont bother any more …. Me too, I've used up most of my mobile data, and still no prize! Switch to someone else's WiFi. Mobile network, wifi, even work (shhhhh)! Are the prizes worked out like Maccas Monopoly? So lots of Parts 1 and 2, and only one Part 3? So is that a yes? Or did I just give you an idea that I regret….. Same here, no luck for the past 2 days :( on several occasions. Same here, keep on F5. What I could guess is my time spent on this (max. 5 mins refreshing, 2-3 times a day) is way too less than expert Ozbargainers. Sweet, any leads on hotspots for that shiny xbone? Just a quick update. I have just added 12 items back to the hunt. Not because I feel extra generous Wednesday nights. But I have just banned 3 accounts holding 4 items each, as these are cheaters. All the items held by those 3 accounts are released back to the hunt, and accounts are banned. Yes we know who you are and what you are doing. Don't use the uni network for scrapping by the way, lest you want to have the entire network blocked on the firewall (which might be a good idea during exam weeks). A full audit will be done at the end of the treasure hunt. I won't be surprised that I'll be giving away less prize than I have planned. This more like fun activity, i do not know why people cheat here and make mockery of themselves. Good work scotty. Well done with picking up on the cheating pricks! Well done Scotty :) I thought the Marketplace was a lil crowded! Was that account a sockpuppet of the other banned chap from the ACT? I traded with that account :/ Hope that's not an issue! Thanks for the hints… Finally manage to find one. you could say where / what - so others don't waste even more time. lol first time I have won a 'prize', well hopefully can make a deal to exchange. I didn't even refresh, just pure luck which makes it more satisfying. Just Nespresso U Part 1/3, not sure what I will able to exchange with at this stage. I exchanged one of those for a t-shirt. Still a few days left — just put it the market and see whether people with other parts are willing to trade items with you. 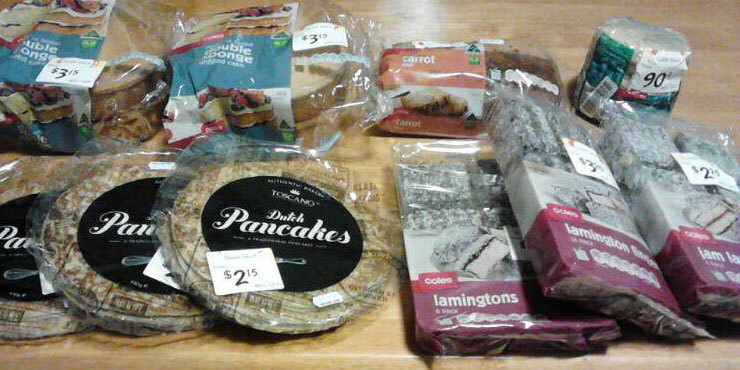 Most requested item is Coles Gift Card $25, followed by OzBargain T-Shirt. One OzBargain T-shirt has been traded 5 times. nooo… the other day I noticed something in between deals but for some reason ignored it and now discover that a treasure hunt has been going on. haha, oh well. Happy Birthday Ozbargain!! Only 4 items left in the hunt. I'll probably add another 5 T-shirts into the hunt later today. I had similar when I accepted a trade, but was with only 1 other person. Maybe if a person has multiple trade requests on that item, the trade requests 'stay' with the item, rather than the person? Ah yes, that does seem like a reasonable hypothesis. And both Chromecast Part 1 & Part 2 as well. Hey Scotty, do you keep a log of the 'displays' of treasure. Would be interesting to see if I ever missed a chance or I was just never lucky enough. Yes, people often have pages loaded with treasure in there but didn't get spotted. Thanks that was the sort of stat I was thinking of. Happy birthday Ozbargain and happy browser refreshing Ozbargainers! To another year of excellent savings, product reviews, jokes, and community spirit. Scotty, have all treasures been claimed now? Only 2 items are not claimed. I am now setting them to possibly appear on all deals — saving you guys hunting down specific pages. For those who have treasures in your inventories, after tonight you'll be presented with an address form in your marketplace page. If your treasure is not digital goods (gift cards, Getflix), you'll have to fill that in & I'll organise the delivery. I have half a chromecast, would rather give it to a deserving person if possible. Does anyone have part 2 of getflix and is willing to trade with a tshirt or a Nespresso part1? What did you get lozbargain? Nice, that is a very successful trade. Bag envy. Much bag envy. Have you considered creating basic backpacks? I'd take one. Know someone who could do with one. Must have comfy straps around the arms. You'd get endless free advertising. Problem for backpack is — they are relatively expensive to source, especially the good ones. Price on Alibaba is probably not a good indication — once you request some customisation & limited quantity (say, you only need 200 bags) they can get expensive quickly. Easier with plain backpack with an OzBargain badge sew on top. with an OzBargain badge sew on top. Scotty, maybe an OzBargain 'clutch purse', for the ladies, would be an easier piece of merch to source. Extra space for coupon storage would be a thoughful touch. Maybe do actually consider issuing OzBargain badges in a tangible form. A suitably emblazoned Turnip - down at her local shops and beyond - would certainly be an impressive promotional vehicle. Kindly send 'Li'l Miss Envy' an OzBargain bag. I am sure that she will carry it with pride. 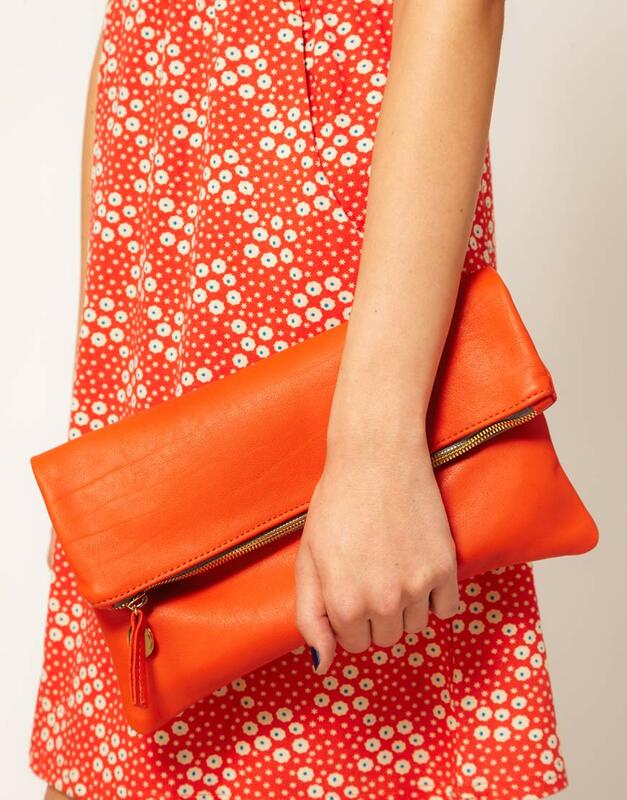 Orange clutches are super classy. I like them. @Jar Jar Binks: I can envisage the OzBargain logo on those really easily! 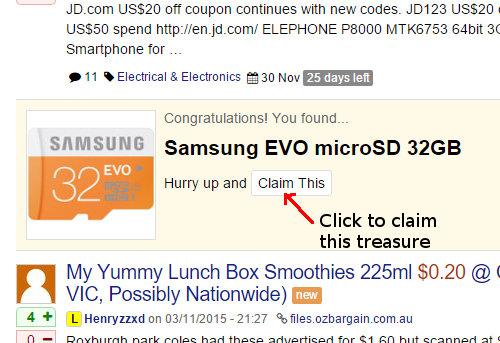 What about an ozbargain wallet with a spot for coupons? @treeman: Indeed. Maybe a subtle, very burnt-orange-colour, for that particular bit of merch.. Also, a discreet, embossed, OzB logo in corner. Proper coupon bandits may still require that w.turnip-suggested backpack for their coupon haul. Defiantly and definitely, if the U.S. coupon craze ever arrives here. Consolation prize! Thank you Ozbargain. Any chance of a size guide for the t-shirts? When the competition first started I was one of the members refreshing certain pages every few seconds, although I only did this for a few days on and off when I happened to be viewing OzBargain. Once the prizes became fewer and fewer I went to checking each page from top to bottom and then reading the comments or the deal. Everytime I've loaded a page today I've gone up and down the page out of habit, even though the competition is over. How do I break the habit? Buy eneloops and pretend you won them. Guilty as charged! :( Except it wasn't eneloops , it was this. I'm planning to tell wiki, the twins and myself that I won it in the treasure hunt. Actually I did win some eneloops so it was worth the effort in the first few days. 8 pack or Family pack? 8 x AA according to my Treasure Hunt page. Are we gonna have a winners list Scotty? There are 92 "winners" so I don't think I'll list them all. I'll be doing a lot of posting & shopping in the next couple of days. Instead of me revealing who have won the big items, maybe the winners themselves can come here and announce it themselves (if they want to). I'd be interested in seeing the list. I'm curious as to how many were members who pop up on a regular basis or just members who randomly got lucky. Car Making Very Loud Noise & Fail to Start, Thoughts? Decent Inline Skates / Rollerblades for a Beginner? Hoyts Tickets Purchased from RAC, Can It Be Booked in on Hoyts Website?